Here’s an updated 2018 version of this post for you to enjoy! 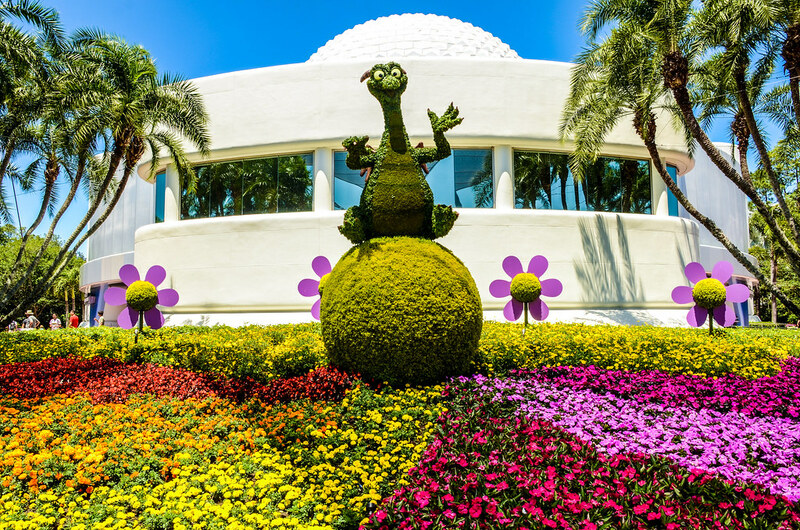 The Epcot International Flower & Garden Festival showcases beautiful flowers, plants and food around Walt Disney World’s Epcot every spring. In 2017, the festival runs from March 1st to May 29th. The festival is running for the 24th year in a row. While the entirety of the festival is difficult to cover, this post will give an overview of what to expect and our favorite parts of the festival. Over the years Epcot has become Festival Central. 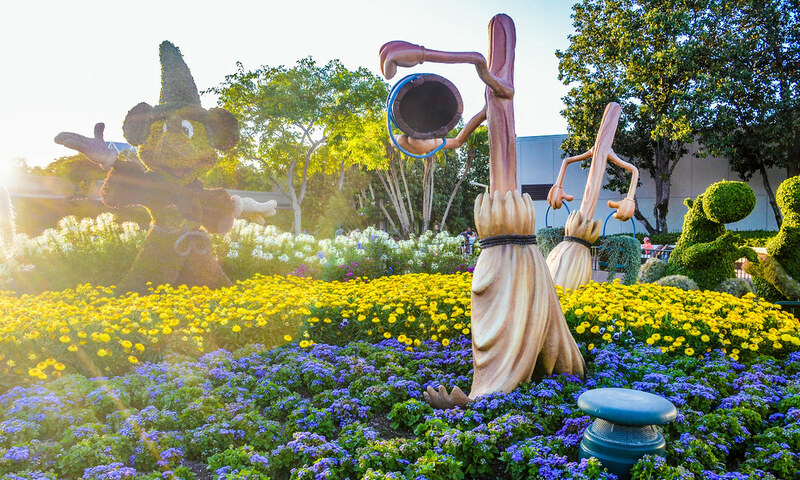 The Food & Wine Festival and Flower & Garden Festival have each taken up more dates every year. This year brought the Festival of the Arts in January. While the festivals started as a nice addition to slow parts of the year, now their reach may be a bit overextended. I suspect a festival in the summer will come over the next few years. Aside from huge crowds, this isn’t that big of a deal if the festivals offer something unique. 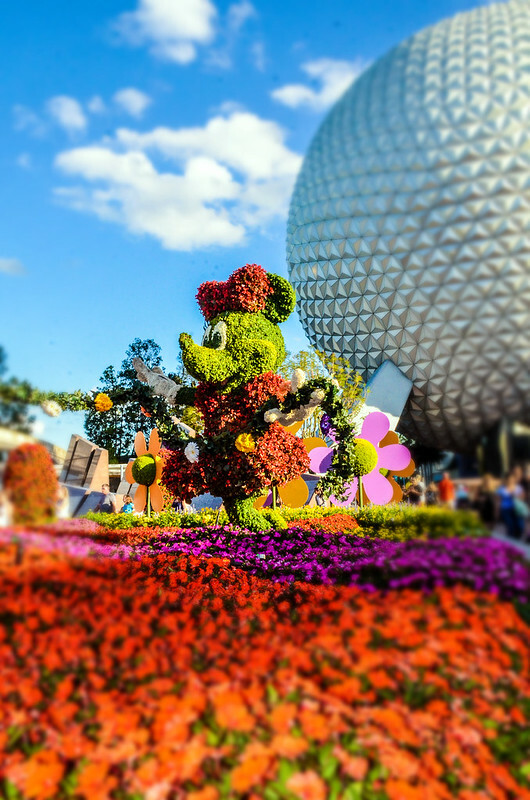 While I can debate the merits of the Food & Wine Festival (which we’ll cover when the time comes), I do think the Flower & Garden Festival does bring a nice addition to Epcot. Epcot began as a park that, among other things, celebrated the beauty of the world and the ingenuity that would lead the planet into the future. Flower & Garden showcases both of those ideas and combines them seamlessly. 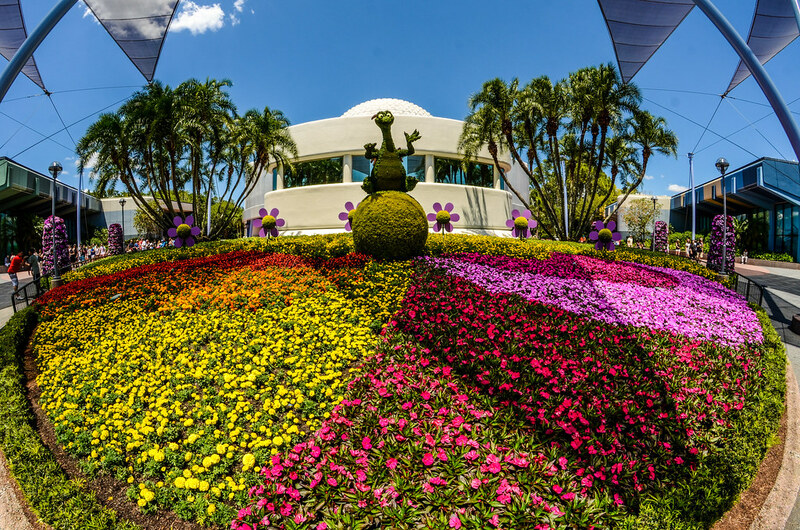 Using the beauty of blooming spring flowers, Epcot enhances those with topiaries, flower beds, butterfly gardens and, of course, food. We’ll start with the food. Like the other Epcot Festivals (notably Food & Wine), Flower & Garden utilizes temporary booths around World Showcase to offer unique food items to guests. These booths are called Outdoor Kitchens. Most of these booths are themed to the countries around them. Here is a complete list of the booths and the menus that coincide with them. Most of the food items range from 4-7 dollars, with a few outliers. The alcoholic beverages range from $7-$10 typically and the non-alcoholic drinks are usually around $5. 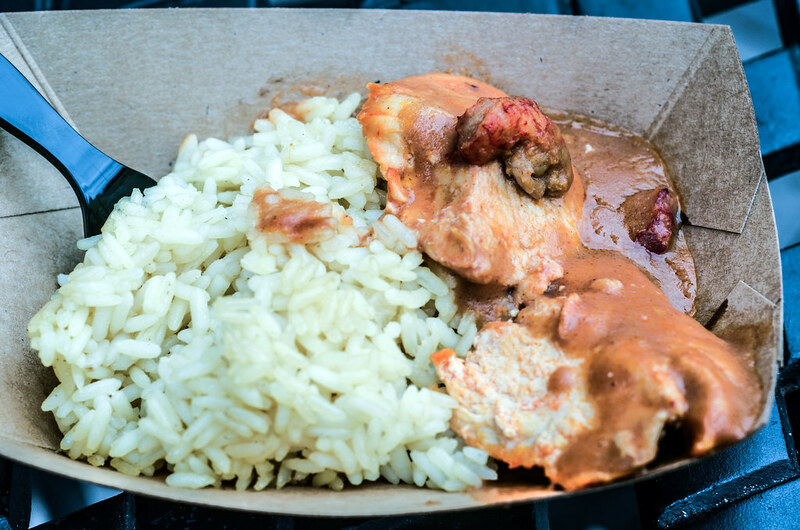 The portion size is never very large but is comparable to most snacks throughout the parks. Generally, I think the items at these booths is a little overpriced for what you get but the quality of food usually makes up for that. I’ve never been very disappointed in what I’ve paid for a snack at Flower & Garden or Food & Wine Festivals. I didn’t get a chance to sample as many items as I’d like (trying all of them would be ideal but hardly cost-effective) but here are a few of my favorite items that Melissa and I tried. The Northern Bloom booth was a favorite of mine. 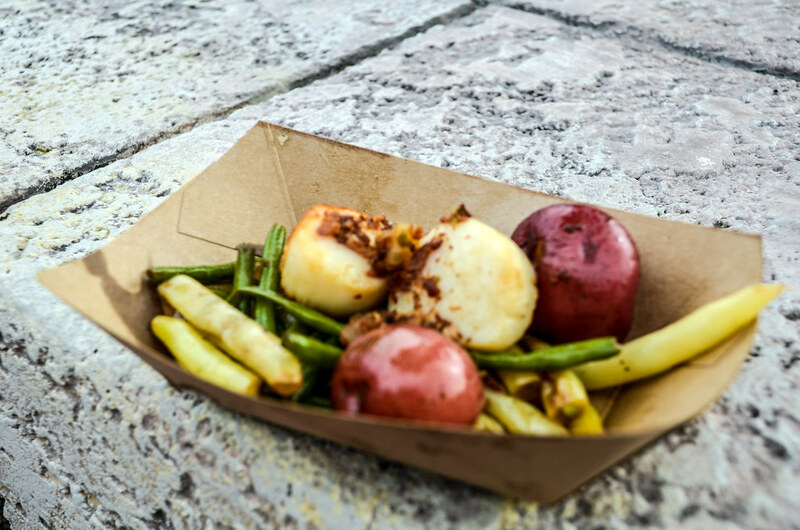 Sitting outside of the Canada Pavilion, I tried the Beef Tenderloin Tips and the Seared Scallops with French Green Beans (both pictured above). 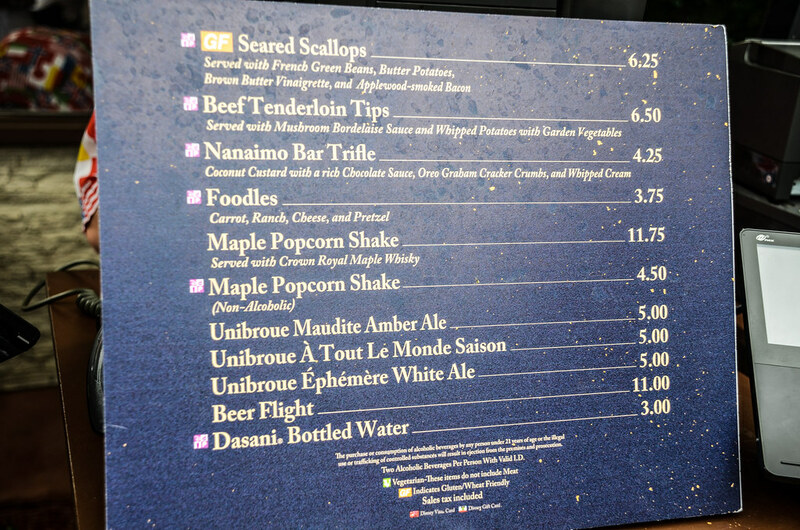 These were my second and third favorite items I tasted at the Festival and I can never decide which order. The scallops were prepared nicely and had a rich, buttery flavor. I thought the green beans and potatoes paired with them was a nice addition. My only complaint is that the dish could have used another scallop or two. The Tenderloin Tips were also delicious and rich in flavor. The meat was really tender and the mushroom sauce with it was a great pairing. The mashed potatoes were pretty average but didn’t bring the dish down at all. I’d happily recommend either of these items. At $6.25 and $6.50 each, I found the dishes to be priced accurately. This was a good way to taste something a little more expensive at a lower price point. 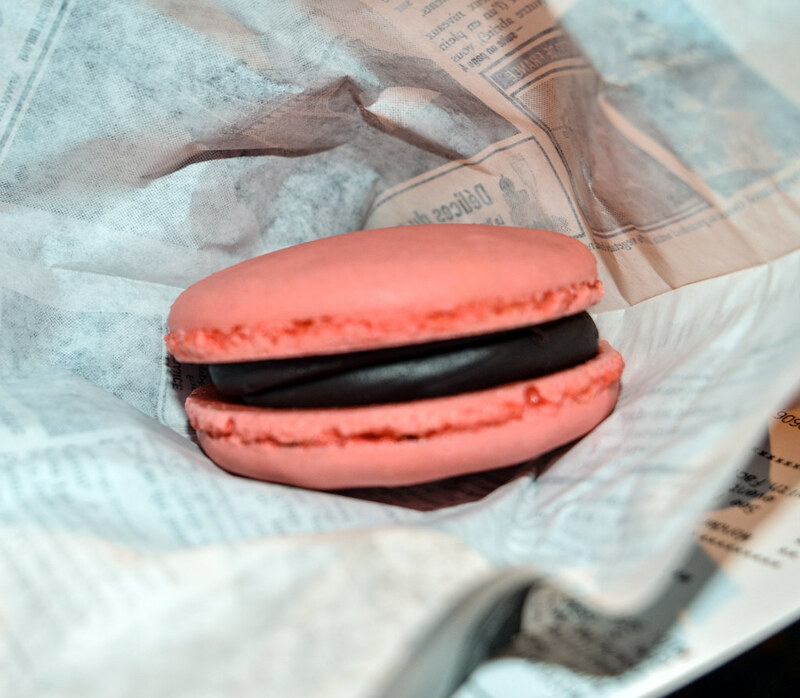 Melissa also really enjoyed the raspberry chocolate macaron from this booth. This isn’t a great value but if you enjoy desserts then I don’t think you’ll regret getting this. 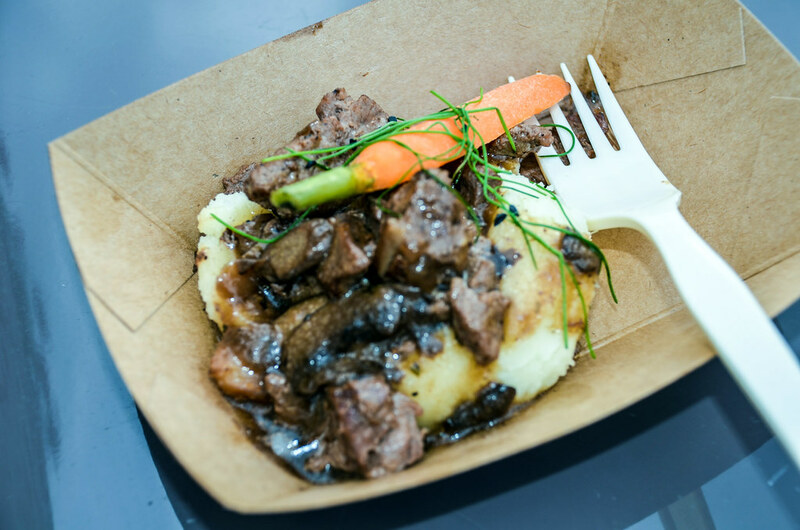 I tried the Carne Asada from the Florida Fresh booth and found it to be good but not great. 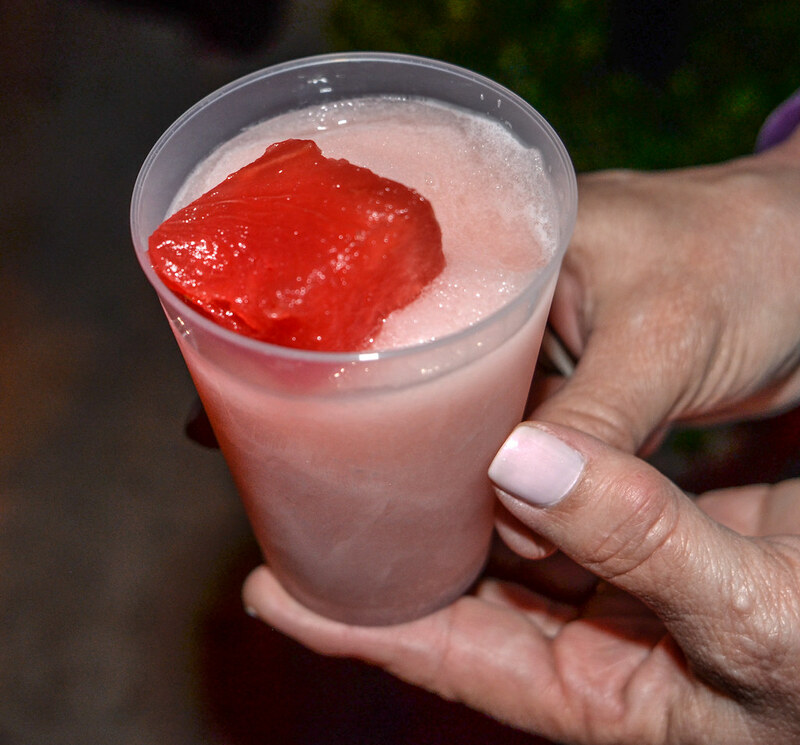 Same goes for the Watermelon Juice there, although I did like Watermelon Cucumber Slushy more. Melissa also really liked the Lemon Scone the Cider House booth (UK Pavilion). I missed out on trying that one but she gave it a rave review. Those were a few of our favorites that we tried and, as I said, I would have liked to try a few more. While the food is good and follows a pretty natural theme, the star of the festival are the topiaries and gardens. These are spread throughout the park but reside near or in World Showcase more than anywhere else. 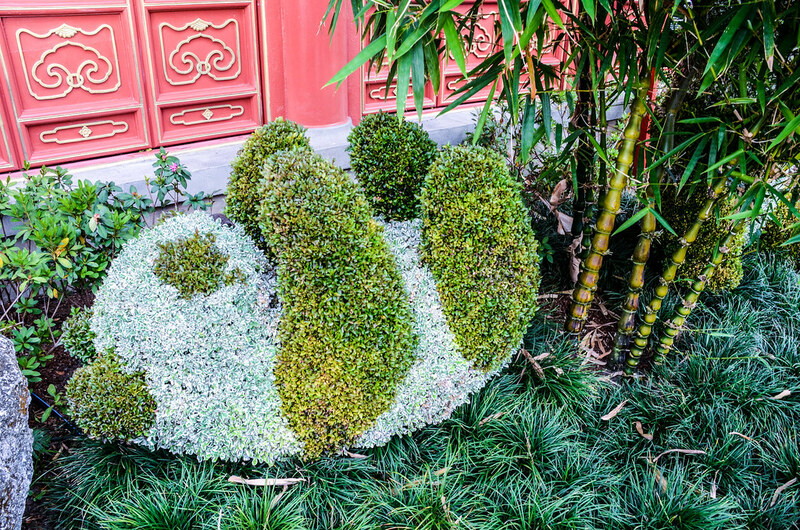 The gardens are a nice treat that you can happen upon naturally throughout Epcot. Most of that is thanks to the season and flowers blooming. 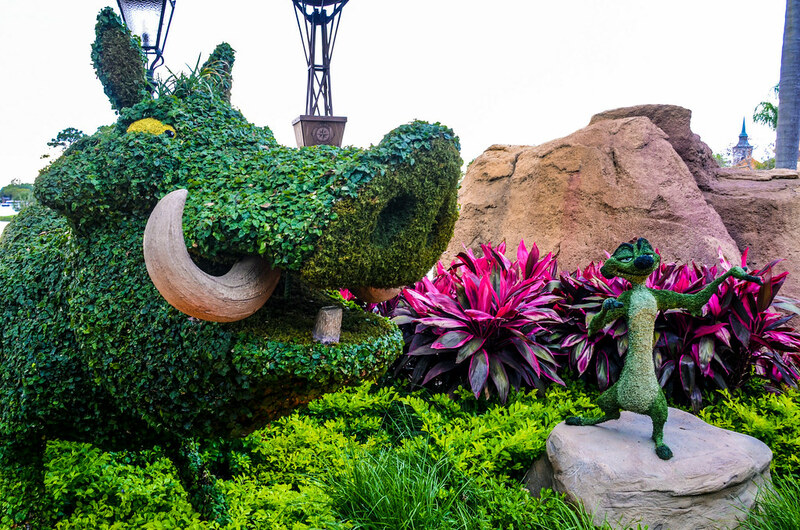 Many of these gardens or plants could be found throughout Disney Parks thanks to the wonderful horticulture staff that the parks utilize. There are exceptions that make Epcot unique though. My favorite of which are the beautiful gardens that surround the ponds on your way to World Showcase. If given the chance, entering the park via monorail is a great view of those gardens. Another of my favorite gardens were the bonsai trees in the Japan Pavilion. I enjoyed seeing the different types of plants aren’t typical in our country. 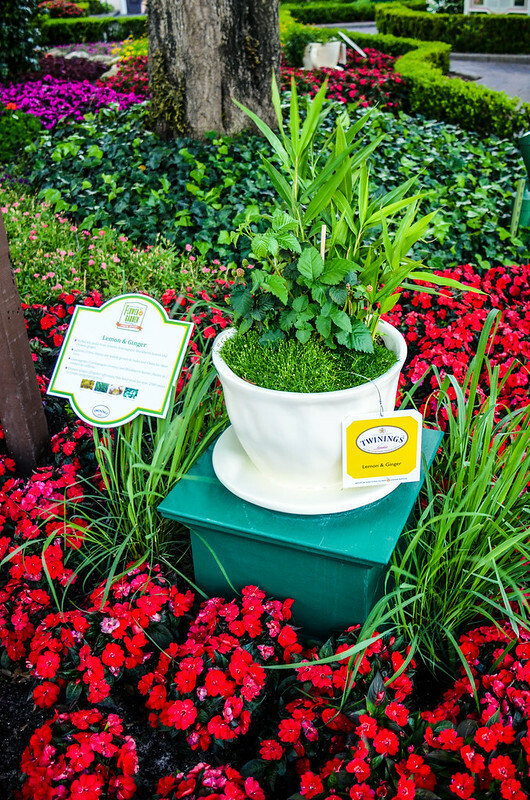 The topiaries are a great treat, that are a little less ‘natural’ than the gardens. That doesn’t make these presentations any less impressive or beautiful. 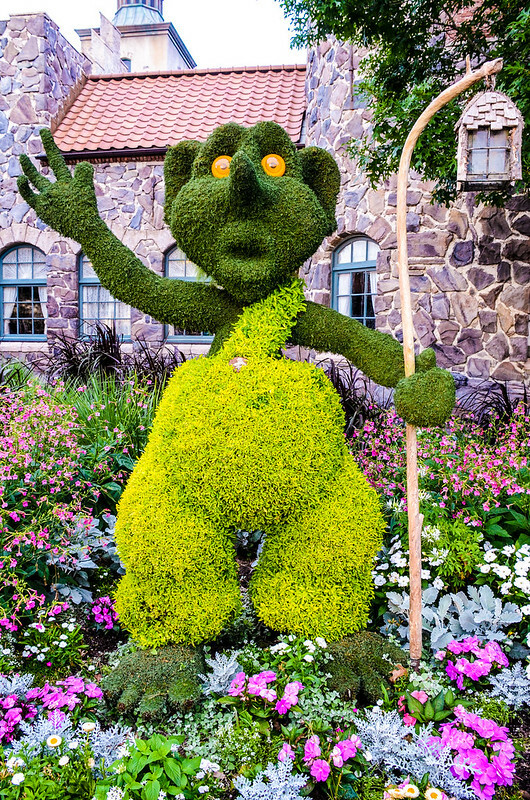 These topiaries are most often of Disney characters. Here are a few of my favorites throughout Epcot. One small portion I was disappointed in is the way the topiaries were lit up at night. 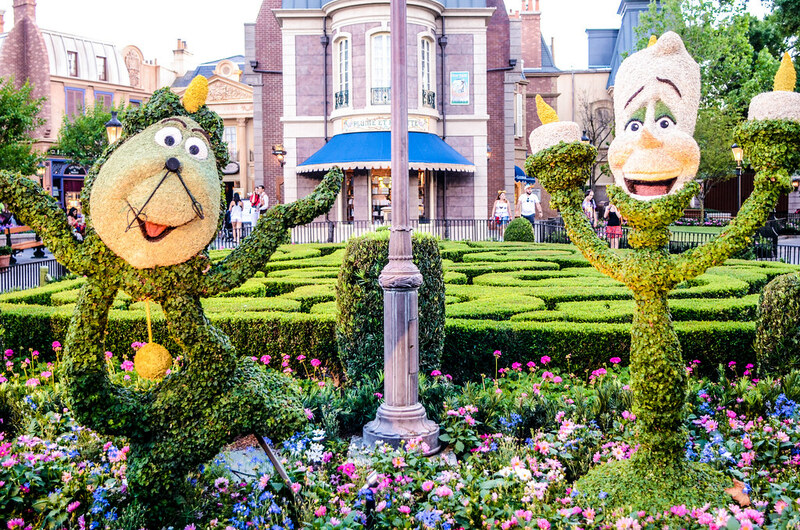 I don’t think the lighting they put on the topiaries was flattering. Still, this is a minor issue with only a few of the topiaries. Anyway, Figment gets his own little photo section because he deserves it. 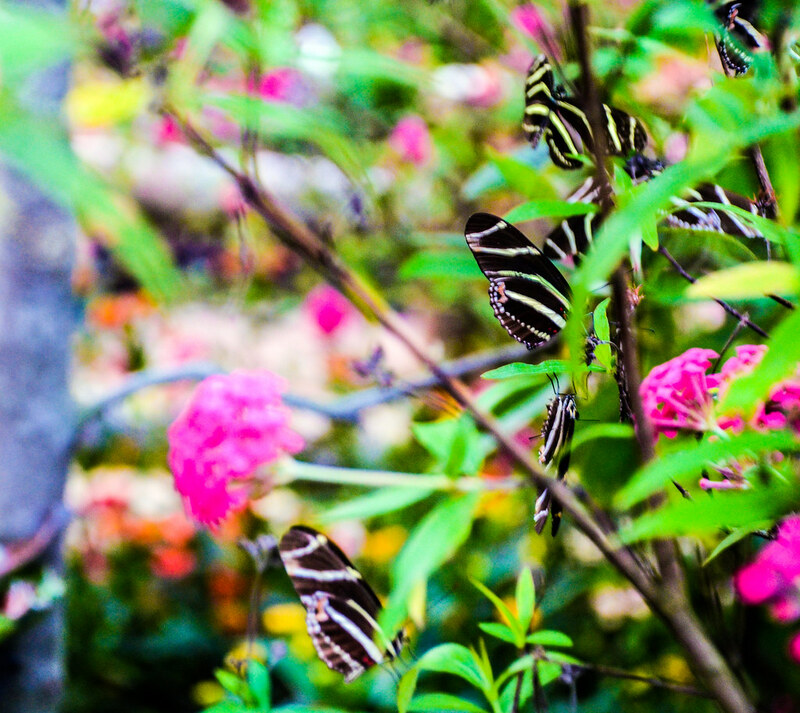 One of my favorite aspects of the festival was the Butterflies on the Go exhibit. This resides in Future World near the between Inventions West and World Showcase. I could have included this in the Topiaries and Gardens section but I spent a good amount of time in here. 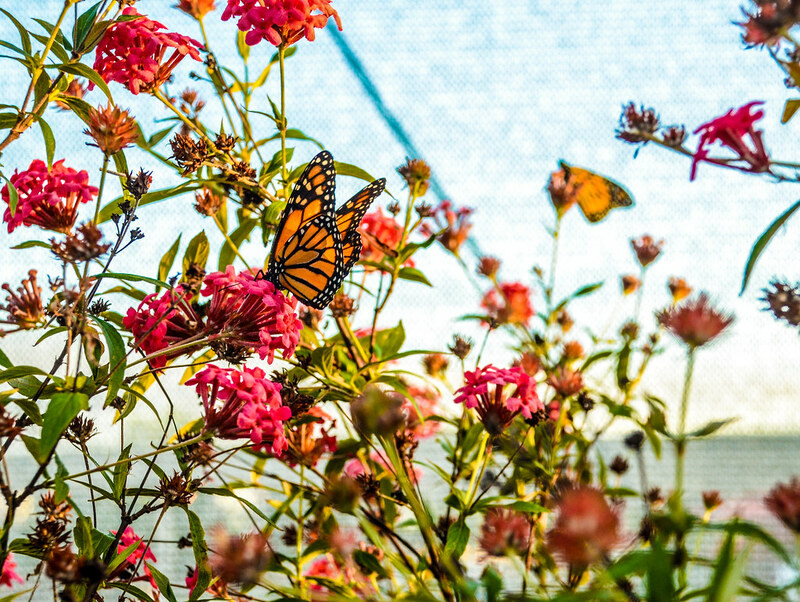 There were an array of different butterfly species as well as plants. While the garden isn’t very big, we spent nearly half an hour in there snapping photos and looking at all the different plants and butterflies. I thought it was a beautiful area that was really inviting. What Else Does the Festival Offer? 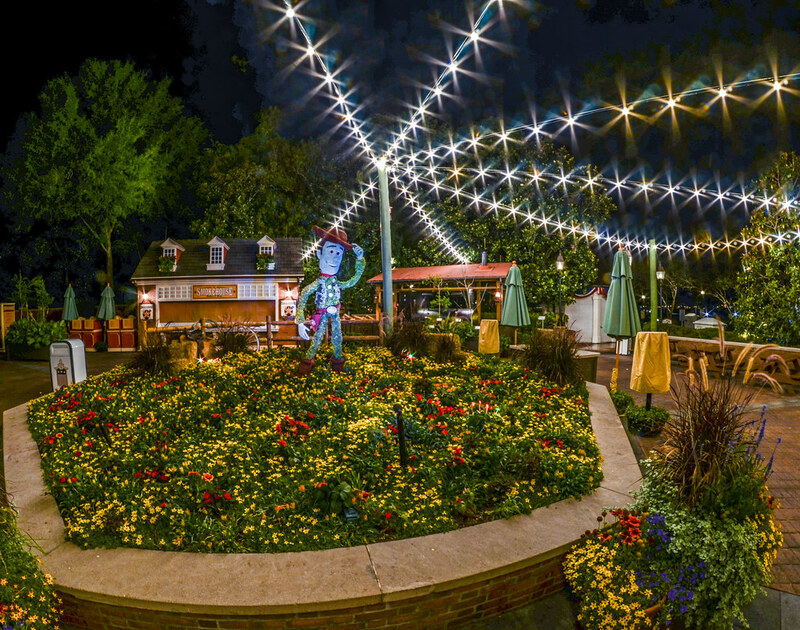 The Flower & Garden Festival also features the Garden Rocks Concert Series. There are plenty of bands that play throughout the course of the festival, mostly on weekends. While different genres of music appeal to others, I can’t say the concert series interests me that much as most of the bands aren’t huge draws for my taste. Still, it’s worth checking out the lineup when it comes up every year to see if you want to take the time to watch a 45 minute set from some professional musicians. The bands always sound good while walking by. For kids, there is an egg hunt as well as some temporary play areas. Who would have known, kids don’t really enjoy looking at flowers and eating somewhat experimental foods for hours on end. While I don’t consider the kid entertainment to be anything extraordinary, it is a nice addition for when the little ones get a little restless. There are also tours and presentations available to festival goers. Most of these cost money and I recommend reserving them early. Here’s a list of those available. We took part in the complimentary English Tea Garden Tour. This was free if you sign up on the day of the event at the UK Pavilion. 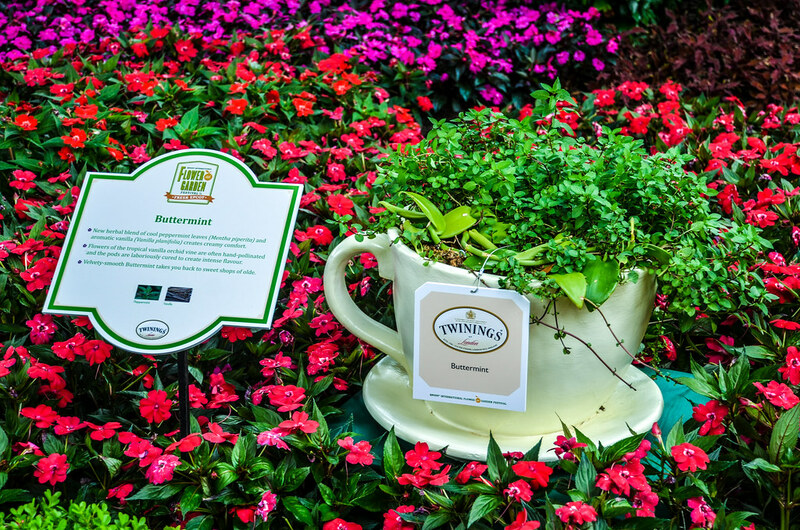 This tour took us around the UK gardens where tea cups were filled with the plants that make up Twining’s tea blends. While the tour heavily promoted Twining’s, I found it to be very informative and I thought our guide did a great job. The tour lasted about half an hour and helped guests understand what goes into making tea. It also helped me understand what teas I might be interested and vice versa. 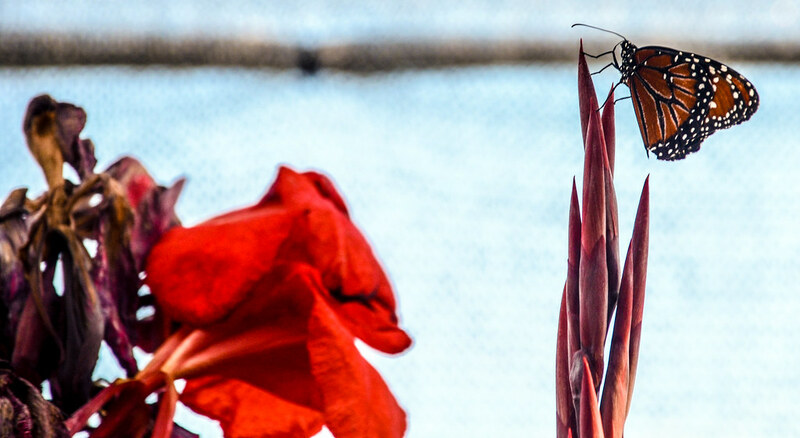 Is the Flower & Garden Festival worth making a special trip for? How much extra time will I spend in Epcot due to the Festival? Above are the two questions I consider to most coincide for those interested in the festival. There’s no hard and fast rule for this. 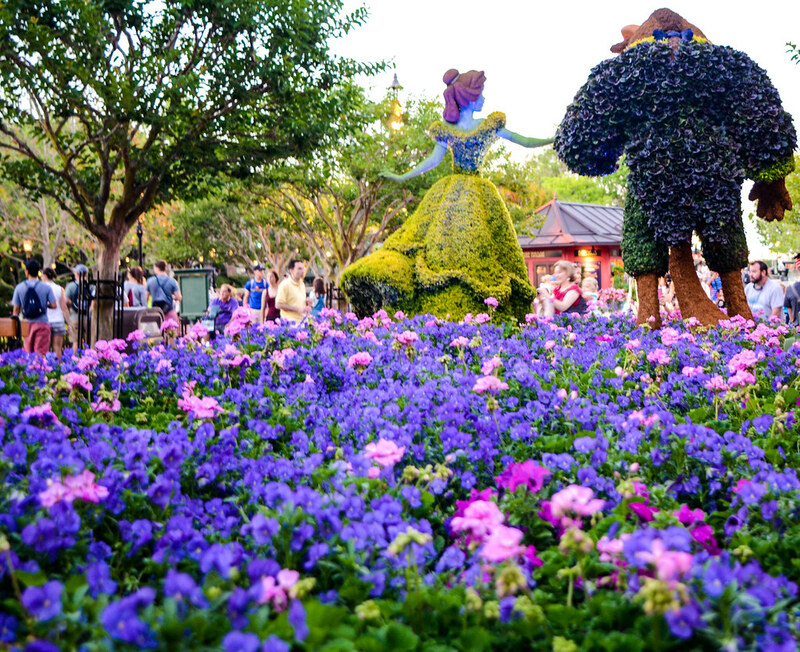 If you like and enjoy plants more than the average person then the Epcot Flower and Garden Festival is definitely for you. Even if you’re not that into plants, like me, then you will still probably find the festival interesting, informative and beautiful. As for how many hours or days to allot for Epcot when the Festival is ongoing… That answer is even more tricky. 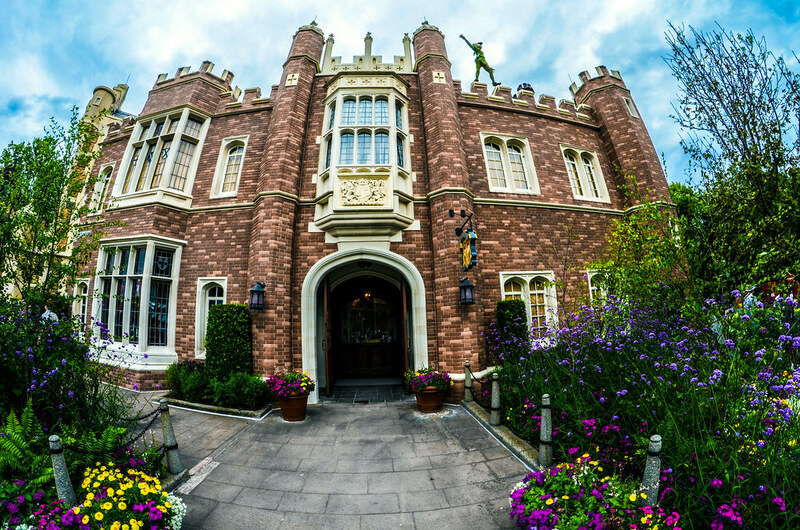 I think you could fill up just a day exploring the Flower & Garden portion of Epcot as well as the World Showcase Pavilions. More realistically, if you’re planning for a day and a half for Epcot on a normal trip, I’d just make it two full days. If you have kids, that may be pushing it but I think most adults could easily spend 2 days at the park experiencing Epcot and Flower & Garden. 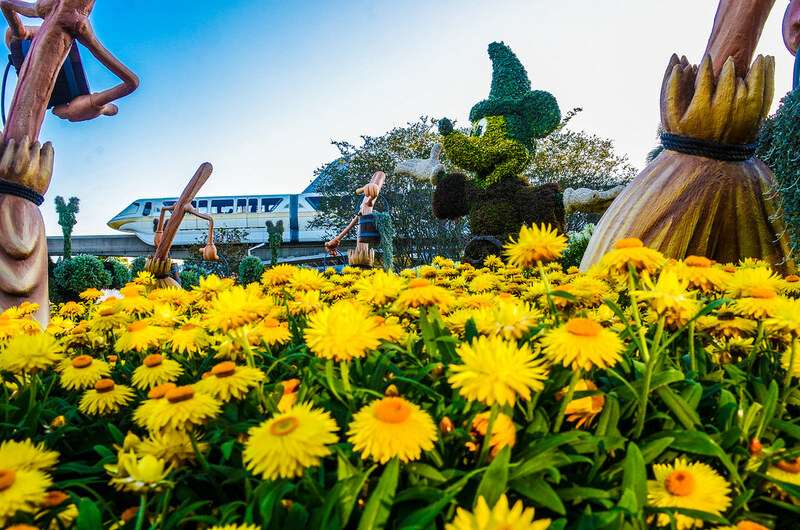 If you have questions or comments about the Epcot International Flower & Garden Festival, please leave them below in the comments. 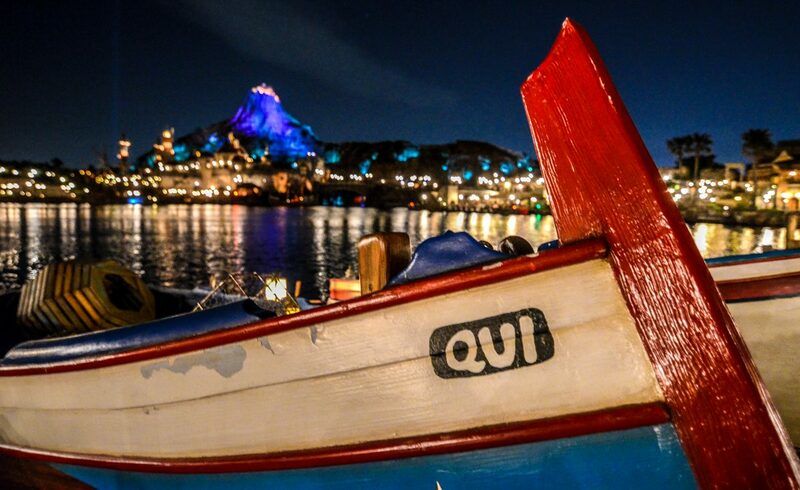 If you enjoy what you’re reading here on Wandering in Disney, please subscribe to the blog on the right side of this page. That’s where you can find links to our social media accounts, as well. Thank you for reading!